The Resale Guide has access to thousands of great promo products available and ready to market your Resale, Thrift, or Consignment Business. Your Custom Business Logo will be branded on any of thousands of great Ad Products you can give away. With many years of industry experience, we have access to the best vendors and prices anywhere! 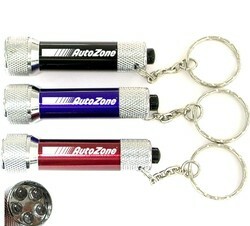 This handy LED flashlight is available in many colors. Imprinting or Laser Engraving Available. Perfect for marketing a business or service! © Copyright The Resale Guide All Rights Reserved.